CANADA: Newfoundland-based Beothuk Energy has unveiled plans for a C$4 billion ($2.87 billion), 1GW offshore wind project off the south-west coast of Nova Scotia, south-east Canada. The project would form part of what the company calls a "greater Atlantic Canada regional plan" buoyed by proposed climate change action plans in both Canada and the US. Power would be exported to New England in the US via a proposed 370km subsea cable dubbed the Can-Am Link. 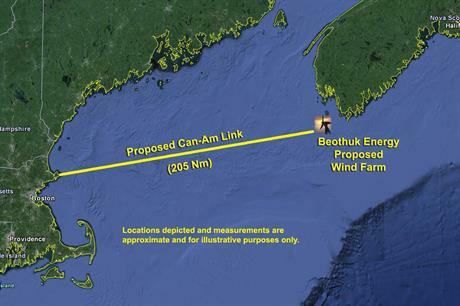 The project site is about 20km from shore in shallow waters of 30 metres or less and outside of major shipping lanes and commercial fishing grounds, while the Can-Am Link would make landfall close to existing transmission facilities near Boston, Massachusetts. Beothuk has not released a timeline for the project, but says it is in discussions with various Canadian and US utilities regarding power purchase agreements. It is also talking to other independent power producers about potential partnerships. To date, Beothuk has formed working relationships with Jacob Capital Management, Siemens Offshore Wind, Talon Energy and Maderra Engineering, the company said. "As both Canada and the United States seek to meet their climate change goals, clean, renewable offshore wind is going to play a major role in helping decrease reliance on fossil fuels," said Sasha Jacob, CEO of Jacob Capital Management. Nova Scotia recently passed the Marine Renewable Energy Act, designed to ensure appropriate licensing and environmental protections are in place for offshore wind, tidal and other sea-based projects. Beothuk has also proposed a 180MW offshore demonstration project off the western coast of Newfoundland in St. George's Bay.